Locanda di Palazzo Cicala, hotel in Genoa city centre, presents the Sea Emotions package, which includes dinner in a local fish restaurant, carefully chosen among the most renowned in the Centro Storico, a guided tour to the traditional fishmongers shops with your own personal shopper, and one, of your own choice, among the following options.. The Locanda di Palazzo Cicala is still promoting the city of Genoa, this time offering a special week-end deal which opens the door to the many picturesque local amenities. Therefore with "Sea Emotions" the Locanda offers a two-day route which has the sea as its protagonist; our Guests will be introduced to the true Genoese sea traditions, being able to discover the most authentic and genuine features of the city. A week-end to be spent exploring what sea, sun and fish can offer to the five senses. Fishing tourism: Half a day spent onboard of an authentic local fishing boat, sharing this unique experience with a fisherman. You will have the chance to experience the whole variety of fishing activities, from the throwing of the fishing net to the selecting of what has been fished out, while the fisherman will be telling you all the secretes of his craft . The gain of the day will be entirely yours, and, according to your decision, it could be cooked for you at the restaurant. Whale-watching: Half a day spent onboard, following the routes of dolphins and whales, in the area between Genoa and Portofino. The perfect chance to meet these cetaceans in their own natural environment. Excursion by boat: Leaving from the Genoa Porto Antico, you will reach Portofino and Camogli and be able to fully appreciate the Ligurian coast beauties from a privileged point of view: the sea. Genoa Aquarium: the full 3-hour tour of the largest Aquarium in Europe will show you a wide range of animal species from all over the world. 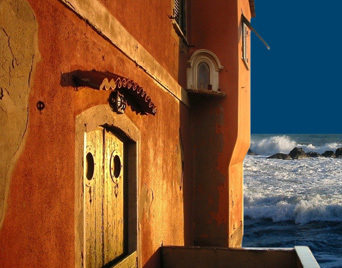 The "Sea Emotions" offers the chance to spend two nights at the Locanda di Palazzo Cical at the special rate of 490 Euros. This offer is subject to availability. Please do not hesitate to contact us either calling us on +39-010-2518824 or e-mailing us at the following address, info@palazzocicala.it . We are at your disposal for any information.